The Turquoise Tanager, Tangara mexicana, is a medium-sized passerine bird. This tanager is a resident bird from Trinidad, Colombia and Venezuela south to Bolivia and much of Brazil (despite its scientific name, it is not found in Mexico). It is restricted to areas with humid forest, with its primary distribution being the Amazon, while a disjunct population occurs in the Atlantic Forest of eastern Brazil. The latter population is sometimes considered a separate species, the White-bellied Tanager, Tangara brasiliensis. It occurs in forest, woodland and cultivation. The bulky cup nest is built in a tree or shrub, and the female incubates three brown-blotched grey-green eggs. Adult Turquoise Tanagers are 14 cm long and weigh 20 g. They are long-tailed and with a dark stout pointed bill. The adult is mainly dark blue and black, with turquoise edging to the primaries. Most races have yellow lower underparts, but this is paler, more cream in the nominate subspecies found in north-eastern South America. 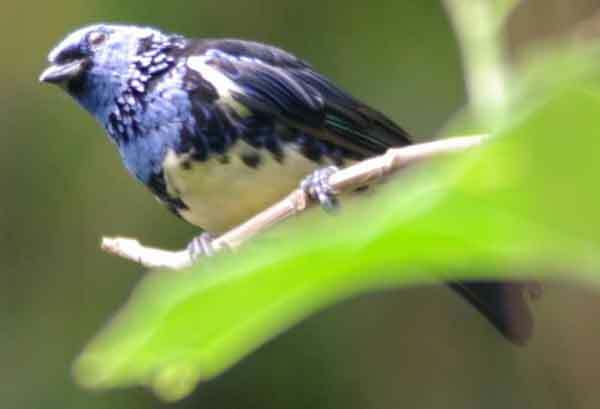 The Trinidadian race, T. m. vieiloti, has a darker blue head and breast and more vividly yellow underparts than the mainland taxa. The taxon brasiliensis differs more conspicuously, it having an overall duller blue plumage, blue edging to the primaries and a white belly. * ffrench, Richard (1991). A Guide to the Birds of Trinidad and Tobago (2nd edition ed.). Comstock Publishing. ISBN 0-8014-9792-2.